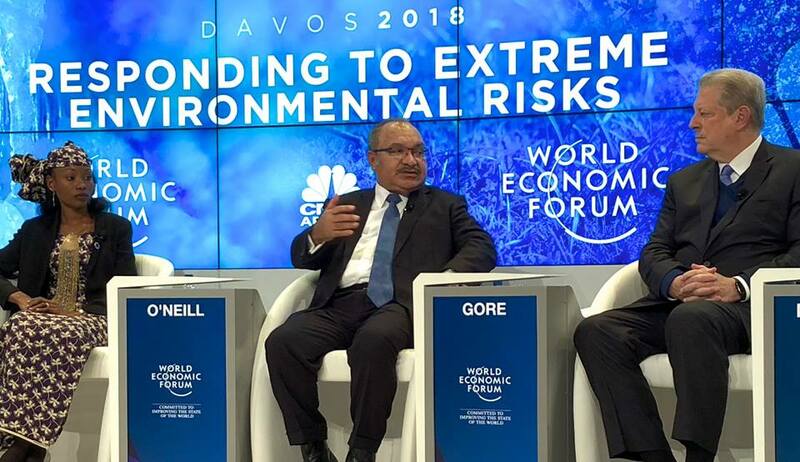 Papua New Guinea is concluding a successful series of engagements at the World Economic Forum this week in Davos, Switzerland, that will have positive outcomes in improving trade, investment and job creation. The Prime Minister, Hon. Peter O’Neill CMG MP, said he is satisfied with discussions at the World Economic Forum where political leaders from a diverse range of countries met with development finance and non-government organisation executives to work to ensure economic development increases and is inclusive. “Successful high-level dialogue leads to policy action, and that leads business stimulation and job creation,” the Prime Minister said from Davos. “This week we have met with leading global figures involved with the financing of development projects, including banks and capital markets. "The meeting this morning involved discussion with former United States Vice President, Al Gore, and Senior Ministers from Indonesia, Denmark, South Africa, the United Arab Emirates and Guatemala. “Papua New Guinea will continue to engage with partners through the World Economic Forum, particularly during 2018 as APEC Chair, to drive inclusive economic expansion. Increasing engagement across the Pacific Ocean was central to discussion with the Pacific Alliance of Latin American economies that is now growing to include Australia, Canada, New Zealand and Singapore. “Trade and investment today takes place across a broad area, and APEC is already home to more than half of the world’s trade and GDP. "The Asia-Pacific is the engine room for global economic growth and we have to embrace the opportunities before us. PM O’Neill said globalisation is a reality, and Papua New Guinea will take advantage of the opportunities that are evolving through the global economy. “Having closed economies has never been good for any country,” the Prime Minister said. “History shows that countries that have not opened up to free trade and investment have suffered as a result of the opportunities they have missed. 1 - Prime Minister O’Neill and former United States Vice President Al Gore speak at an MSNBC Television Panel on Climate Change. 3 - (L to R) Denmark Finance Minister, Kristian Jensen; South Africa Finance Minister, Malusi Gigaba; Former United States Vice President, Al Gore; Prime Minister O’Neill; UAE Environment Minister, Thani Ahmed Al Zeyoudi.